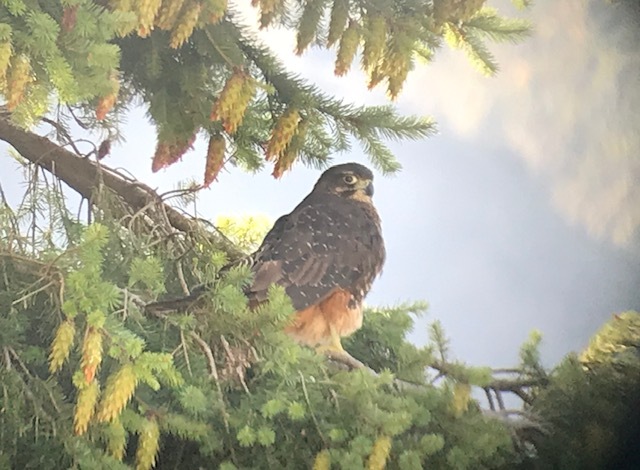 B1RDER: The birding blog of Eco-Vista | Brent Stephenson: Day fifteen - FALCON!!!! This is the blog of Eco-Vista | Brent Stephenson, a wildlife photographer, guide, and birder based near Napier, New Zealand. 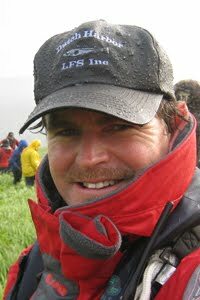 His wildlife, landscape, and people images can be discovered at his portfolio website. Up a little later after our kiwi encounter – even though it hadn’t been a late one. The mountains were clear of cloud and it looked like it was going to be a stunning day. We packed the van and headed to a little forest walk, where we saw a few things like tomtit, grey gerygone, etc. The views were spectacular, but the glacier was a little on the shrivelled side! The rate at which it is receding up the valley is truly frightening. 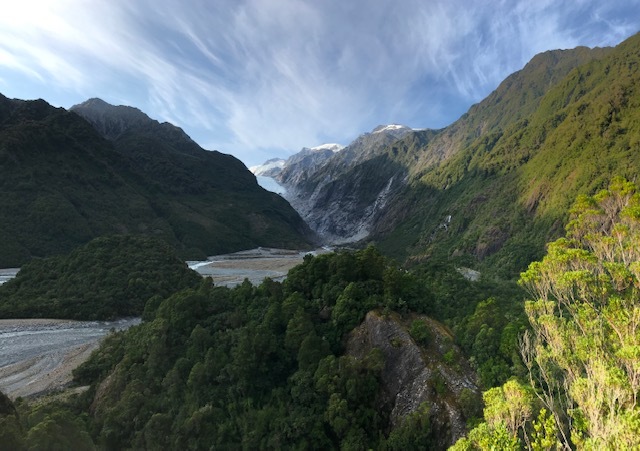 We headed back to the van, and drove towards Fox Glacier. All eyes were on the lookout for our real target bird of the day – falcon. Although we still have a couple of excellent days ahead where falcon is a possibility, leaving it to the last day is a little nerve-wracking! There were a lot of great looking snags for a falcon to be sitting on and looking out for prey, but New Zealand pigeons seemed to be using them, and were often distracting as a flying shape was seen…. Keep looking guys! We grabbed some lunch in Fox and stowed it in the cooler and then a few minutes down the road, BINGO! The call went up for falcon and there in a dead tree beside the road was the familiar shape of a falcon. It looked big, probably a female, and a young one at that. As we stopped the van and jumped out the bird flew, chasing a sparrow or some small passerine. But the chase seemed half hearted and she broke away and disappeared into the back of a large conifer. Damn! But we quickly realised we could drive a little and get a different and closer angle, and so in doing that we got really great views of the bird perched. We had the scopes on her and watched her for quite some time, before she flew to a different tree, where we again were able to scope her. Very very cool – and it is not every day you are able to get scope views of a killer bird like this! We then headed off, grabbed coffee, enjoyed the sunshine and some stunning views of the mountains – Tasman and Cook (Aoraki) both clearly visible. Heading on further south along the coast we made a little stop to enjoy some Hector’s dolphins frolicking in the surf, and then a lunch stop, enjoying more beautiful scenery and sunshine. Life was good! Heading on further we passed Haast township and up into the hills from there, where the scenery became even more impressive. We took another walk in the forest, finding a very cool harvestman crawling across the path, and lots of mosses and filmy ferns hanging from the beech trees. We found tomtit, grey gerygone, and then heard yellowhead further down the path. Before long we had some in view, and they weren’t at the top of the beech trees which was nice of them. They were almost at eye level and about 8-10 individuals put on a really good show. Awesome little gems of the forest that they are. We enjoyed them for some time and then set about searching for rifleman. The calls were everywhere, but they were playing hard to get. But, finally we had a couple in view and had really nice prolonged views. Let’s hope their cousins play nicely with us tomorrow! We then head onwards to Wanaka, making some scenic stops along the way. It sure is a beautiful part of the World. We checked in to our accommodation and then headed to an early dinner. Superb meal on the lake shore and then an early night. It looks like rain tomorrow, and we have a rendezvous planned with a bobbing wren! Day twelve - baby albatross! All information and images contained on this site are © Brent Stephenson, all rights reserved. Simple theme. Powered by Blogger.